1. 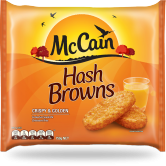 Prepare McCain Hash Browns per packet instructions. When about halfway done, prepare poached egg, as per steps 2 & 3. 2. Pour cold water into a large saucepan until approximately 6cm deep and add the vinegar. Bring to the boil over medium heat and reduce heat to low; water should still be simmering around the edge of the saucepan. 3. Crack 1 egg into a small bowl. Using a slotted spoon, swirl the water in a circle. Once the water pace has slowed a little, pour the egg into the centre of the swirling circle. Cook the egg for 2 to 3 minutes for a soft yolk, 3 to 4 minutes for a firm yolk. Remove the egg with the slotted spoon and place on a paper towel to drain. 4. 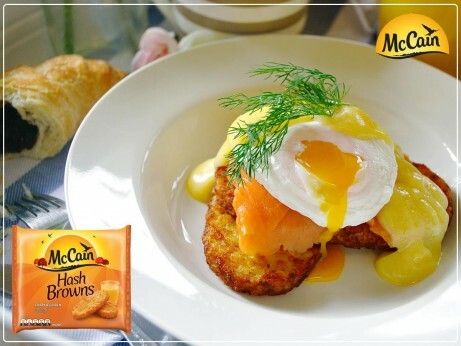 Place the cooked McCain Hash Browns onto a plate, place a few slices of smoked salmon on the top of each, top with the egg, spoon over hollandaise sauce, and garnish with a fresh dill sprig. 1 Prepare McCain Hash Browns per packet instructions. When about halfway done, prepare poached egg, as per steps 2 & 3. 2 Pour cold water into a large saucepan until approximately 6cm deep and add the vinegar. Bring to the boil over medium heat and reduce heat to low; water should still be simmering around the edge of the saucepan. 3 Crack 1 egg into a small bowl. Using a slotted spoon, swirl the water in a circle. Once the water pace has slowed a little, pour the egg into the centre of the swirling circle. Cook the egg for 2 to 3 minutes for a soft yolk, 3 to 4 minutes for a firm yolk. Remove the egg with the slotted spoon and place on a paper towel to drain. 4 Place the cooked McCain Hash Browns onto a plate, place a few slices of smoked salmon on the top of each, top with the egg, spoon over hollandaise sauce, and garnish with a fresh dill sprig.